Horizontal board game with sound (which sometimes lack in HTML 5). The game of launched projectiles, represented by birds that was a great success on mobile phones is now implemented on canvas and works with the Chrome browser, and a user account. The code of a 3D maze is given in example on the manual at Mozilla, and some improvements has been added to it here. 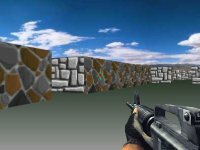 The full Wolfenstein 3D game is also available in the browser. It is a mashup of several technologies that use Canvas for the rendering surface. 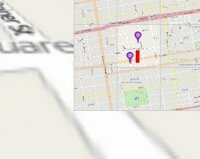 The tools used are Mario Kart, OpenStreeMap and the 3D effect is achieved by a combination of drawImage calls... More on the site. An implementation of the Civilisation game on Canvas, running online in single or multi players. Using the 3D graphics library WebGL, so OpenGL, HTML 5 audio and localStorage, significantly faster than Doom, with 60 fps announced. A platform game similar to old 2D games from Apogee, less the appeal of sceneries. To achieve the effect, two textures of the same image are used, one containing the forms, the other colors. CanvasPad. Test drive from Microsoft. Shows how to program Canvas with an interactive demo that works under Firefox. Code reproduces the movement and the properties of the clothes. Surprising. And a tutorial to explain how to.